Some Companies Will Hire Only If You Already Have A Job Increasingly, jobless workers are facing the ultimate barrier: Some companies are saying if you're out of work, we don't want to hire you. An advocacy group for low-income and unemployed workers says that policy may be illegal. 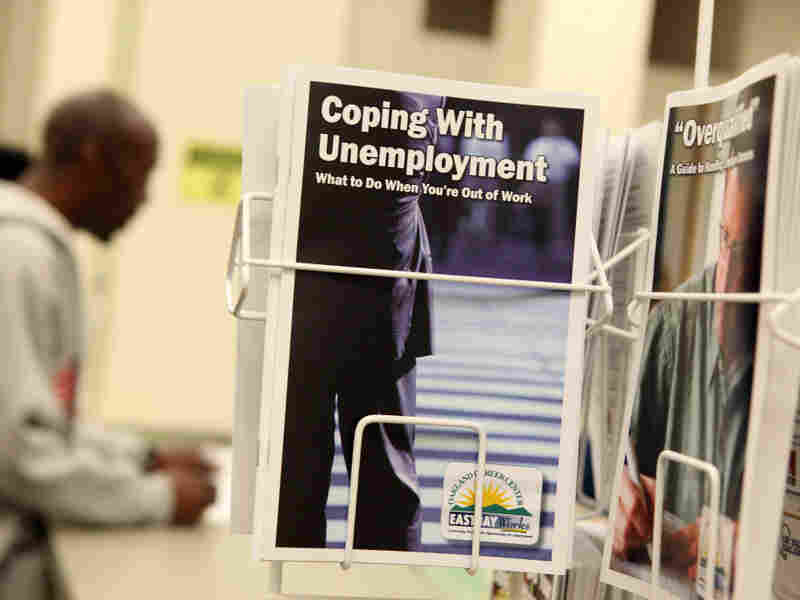 Unemployed workers face big hurdles as they try to get new jobs in today's economy. First, there's the numbers game: Close to 25 million workers unemployed or under-employed looking for jobs. In fact, there are five unemployed workers for every single job opening in the economy. Increasingly, though, jobless workers are facing the ultimate barrier. Some employers are saying if you're out of work, we don't want to hire you. Until he got laid off more than two years ago, Michael Hall was a road warrior. "I would leave my home here in California about 3 a.m. to catch a flight and get home Friday around midnight," he says. In between, he'd often make eight more airline connections as he flew around the country. Hall's job was demonstrating high-tech equipment for data and phone networks. His hard work, engineering training and social skills helped him pull down a solid six-figure income. But now Hall, who is 50 years old and single, spends most of his time looking for work. He says he has applied for well over 1,000 jobs. Every three months or so, he manages to get an interview. But so far, no luck. He says he knows it's not personal. The number and percentage of people who have been unemployed for more than six months has risen sharply since 2008. "But, try telling that to some kid who asked every single girl to the prom in his high school and they all said no. After a while, being told that you're not desired or wanted that many times, it might start to sink in, but you try to block it out," he says. Hall says he mostly manages to remain hopeful. But he is really troubled by one thing: the prejudice many hiring managers seem to hold against the unemployed. "Two specifically came right out and said we don't like to hire people that are unemployed. And one followed that with 'So, why are you unemployed?' in almost an indignant manner, which seemed kind of insulting. And the obvious answer is, well, because people like you don't like to hire unemployed people," Hall says. This is a common complaint from unemployed workers -- that employers only want to hire people who already have jobs and that there's a view that there must be something wrong with you if you're unemployed. Chris Shablak, CEO of West Coast Careers, a recruiting and staffing company, confirms those perceptions. And he says he has clients who tell him they don't want him to hire unemployed workers. Shablak thinks there are legitimate reasons behind that strategy. "If you think about the talent in that unemployed market, you would realize that companies rarely lay off their best skilled workers," he says. So, he says it's not surprising that some companies don't want to hire the unemployed. "It's people that aren't top performers. So if you're ABC Corporation and you're trying to hire the best salesperson out there, and you're looking at unemployed people, it might not be the group of people with the best skills," he says. Hall says when he hears that, it makes him feel like an outcast. "It sounds, and it really feels like, society wants you to voluntarily walk out onto the ice floe. And I'm not ready for that. I'm too young to pack it all in. I've got a lot yet to offer," he says. In fact, some other staffing experts have pointed out that given the massive layoffs in the economy, the chances of finding top performers in the current pool of unemployed workers is probably higher than at any time in memory. And there may be another reason for companies to make sure they consider the unemployed. "It's quite possible that discriminating against someone because they're unemployed is illegal," says Judy Conti, who represents the National Employment Law Project, an advocacy group for low-income and unemployed workers. "With record high levels of unemployment and with people being out of work for so long now, clearly this problem and this prejudice is growing," Conti says. Conti's organization has brought the issue to the attention of the Equal Employment Opportunity Commission, and she says the black and Hispanic caucuses are preparing letters urging the commission to take quick action on the issue.